"It is a very enjoyable course because it's half theory half practical." 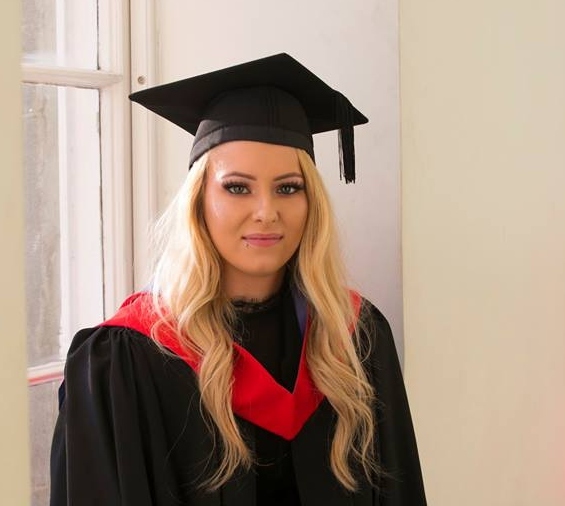 Sarah Looby is from Co Tipperary and went to secondary school in Fethard, Co Tipperary. She has her sights on studying to PhD level and becoming a lecturer as well as gaining industry experience. Why did you choose to come to Waterford? Honestly the first reason I chose it was the location because I wanted to stay as close to home as possible. WIT was the closest with the course I wanted to do because initially I didn’t want to do a four year course because anything can happen in four years... It was the only place that done a stepping stone degree so that you had the flexibility to come and do the amount of years you could do and then come back if you needed a break. What stands out for you about your experience at WIT? For me personally it’s the small classes we have, that’s down to the college being small and its not a university so you do get a lot of personal attention and help. So, if you are ever falling behind the lecturers notice that and they do help its such a close nit community, everyone is very close and very friendly. You are also always comfortable to ask questions because nobody is a stranger in the classroom they are someone you know personally and communicate with throughout your whole college experience. That’s what I love about the college, knowing that if I ever do fall behind I always have someone there to push me back up! What advice do you have for someone considering the course you have just completed? It is an amazing course and a lot of people tend to veer away from it at the start because it is very difficult. But, because you have so much extra help in this college its very easy to bring your level back up again. It is a very enjoyable course because it's half theory half practical. WIT is very good to bring that practical side into it as well and it's very helpful to put your theory into practice. My plans were to come back and lecture here in WIT, eventually. Obviously I will have to go work as you need five years in the industry and I do hope to do that as well. But overall my big plan is to train to be a lecturer, get my masters degree get my PhD and come back to Waterford.